Not quite night, but this nice surprise was the first time we knew there were ducks nesting on our site. This is a mallard female leading her brood. Another photo taken within a day or two of this also shows 4 ducklings, so we think this is probably the entire remnants of the brood (which is typically 8 to 11). Since this was taken we have come across active nests twice (both in 1997) and know where they hide. Unfortunately the moorhens won't tolerate their presence once they have hatched, and see them off ALL the ponds. Once the duck has given up on the harassment, she marches them off down to a brook about 600m away - unfortunately right across the quite busy country road. If we happen to see this in progress it is fairly nerve racking but there is nothing we can do to help. So far we are aware of no casualties to man nor bird. 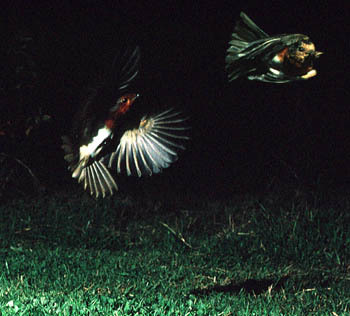 Our night photo kit amazingly photographed these swallows, one with a beak full of insect(s). No we were not this lucky - this is a montage of two shots! The night photo equipment isn't designed to react extremely fast (it takes about 300mS, unlike the insect flight equipment which takes about 10mS) so the birds are already out of the area of crisp focus. But its interesting none the less. Technical: The background is very black even on the originals, taken at F 11 on 200 ASA reversal (Kodachrome) film. So it must have been well past sunset, though not as dark as the background might imply. 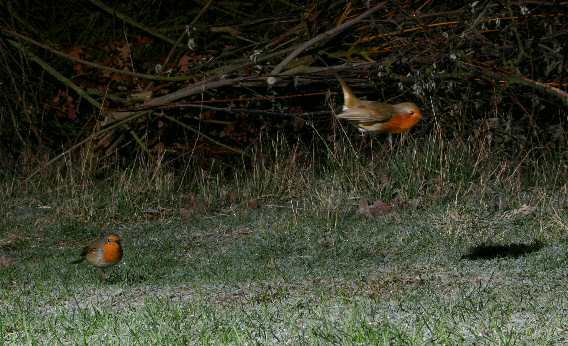 In February 2004 a pair of robins started nesting in a woodpile next to the kit. We repeatedly got shots like this with one bird looking up at the other performing various aerial gymnastics including diving to the ground. We assume it some sort of mating display. 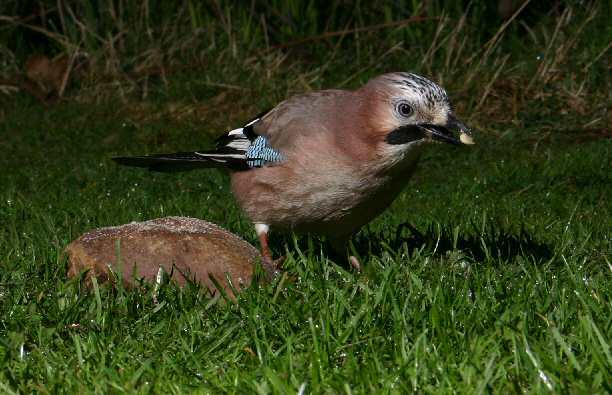 Jays were absent for the first 10 years, but we now see pairs occasionally turning over the leaf litter. This one took a number of photos of itself in a few minutes (mostly half off the edge of the frame!) so it obviously likes the peanut grits bait we put down and is not bothered by the clicks and flashes. Now we use a digital camera we don't have to guess the times - this one was 06:33 BST on 16 Apr 2004, 30 mins after 'sunrise' on a gloomy morning.